Take a good hard look at the picture above. That is the Siberian permafrost. And it is melting. And underneath this vast frozen tundra is enough methane gas to irreversibly alter our fragile planet forever. 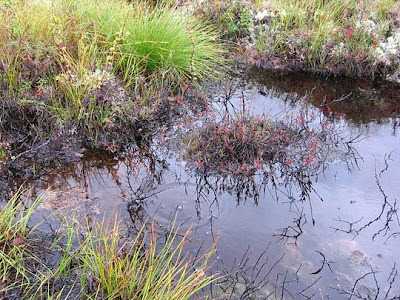 There are more of these peat bogs, like the one above, forming all the time because of global warming and they are releasing tons of methane gas into the atmosphere. And we don't know the consequences this will have on the future of the human species. Got your attention? So while we are having nice little debates over whether climate change is real and what if anything to do about it, the earth is continuing to warm from greenhouse gases we are carelessly putting into the atmosphere. But it isn't too late for us to take action on an individual, national and international scale to stem the tide of global warming before the permafrost completely melts. That is the message author, environmentalist and founder of 350.org (the safest upper limit of carbon dioxide parts per million in the atmosphere) Bill McKibben relays in his new book "Eaarth: Making a Life on a Tough New Planet." I heard McKibben speak on the talkshow "Charlie Rose" on PBS tonight and he discussed the irreversible damage we've already done to the earth and how we need to take urgent action to prevent more damage to our environment before it's too late. "The real climate change debate going on is human beings vs. physics and chemistry." I ask you to read that one more time and think about it next time you confront a climate change denier. Then ask them to read "Eaarth."